IELTS books can be a good way to supplement your study that you may be doing from websites, or to help you supplement lessons if you are getting them. It can be difficult, though, knowing where to start and what is the best book to buy. In order to make this easier, listed below are a selection of IELTS resources which are specifically written for self-study. So this will mean you do not need a teacher to use the books. If you wish to buy the book, click on the picture and you'll be taken to Amazon UK or an IELTS buddy page where you can make a purchase or get more details about the book. This comes with one Book with Answers and 2 Audio CDs. Official Examination Papers from University of Cambridge ESOL Examinations. There are 9 IELTS books in this series, so this is the latest one. Cambridge IELTS 9 contains four authentic IELTS papers from Cambridge ESOL. There is no teaching, but it provides excellent exam practice because the materials are from real tests. The Student's Book with answers contains four complete tests for Academic candidates, plus extra Reading and Writing modules for General Training candidates. A comprehensive section of answers and tapescripts makes the material ideal if you are working partly or entirely on your own. There are a total of 6 practice tests with this IELTS book and a CD. The practice tests have all the modules with answers: writing, reading, speaking and listening. It is a great book as it provides tips and strategies alongside the tests, sample answers for the writing with explanations of why the writing would get a high or low score, and guidance on grammar and topic related vocabulary. This book has six full practice tests (reading, listening, writing and speaking) and includes guidance and exam tips. The first two tests are completely guided with step-by-step advice on how to tackle each paper. There are also extra practice activities, example exam papers from real candidates, and tips that focus on areas where students usually need most help. It has all the answers, audio CDs with all the listening activities from the tests as well as an explanatory key with model answers for the Writing paper. This book provides 4 practice tests and CDs covering the four skills of reading, listening, writing and speaking. The tests are the same as in the IELTS exam. Not only this, there are further practice exercises and the answer keys have explanation notes to explain the correct answers for the practice tests and the further exercises. This is IELTS buddy's own eBook on the writing task 1. It's designed for self-study and it's packed full of tips and special strategies to help you master the writing. It includes line graphs, bar graphs, pie charts, tables, maps, processes, and tips on describing multiple data sources. It can be used by beginners and more advanced students as it works from the basics up to more complex writing. This is IELTS buddy's own eBook on the writing task 2. 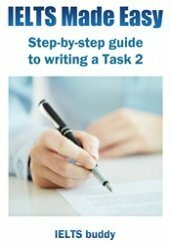 Like the Task 1 book, it's designed for self-study and can be used by beginners and more advanced students as it works from the basics up to more complex writing. 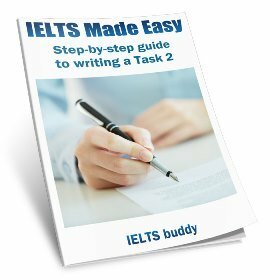 It explains how to analyse IELTS essay questions, brainstorm, plan, and write paragraphs quickly and effectively. There is a special section on opinion essays and a section on coherence and cohesion. This book is for those who are around the 5 – 5.5 level and want to score a band 6 or higher. It is divided into 12 units and each one focuses on a different IELTS topic and related vocabulary. All the key stages of writing are covered in the book as well as tips and strategies. You can learn about writing from using this book, but with writing it is always ideal if you have someone who can give you some feedback, such as a peer. This book can again be used for self-study and is geared towards those wanting a band 6.5 or higher. 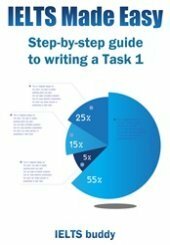 It tackles task 1 and task 2 of the test. Each unit has a model essay and a general interest reading article to help you generate ideas and vocabulary for your writing. 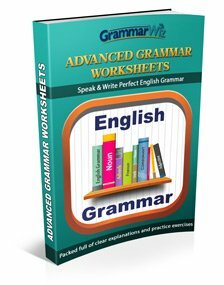 There are grammar exercises too. Also included are real writing samples by students with comments by an examiner to show what is needed for a band 6.5 or higher. Another self-study IELTS book from Collins with a guided-learning approach. This is particularly good for those at a very low level as it is aimed for those currently at band 3-4. There are 12 units with key grammar and vocabulary in each unit. The book also highights common errors and provides model answers and full answers keys. The book is not yet released but can be pre-ordered. This is one of the few IELTS books dedicated solely to writing for Task 1 of the writing test. So if you are just having problems with this part of the test and want further practice then this may be the book you wish to buy. It is for beginners and more advanced students and provides practice on bar charts, line charts, pie charts, tables, processes, cycles, flow charts, objects and maps. It focuses on common mistakes, provides tips, and has model answers for each diagram in order to clarify what the examiner is looking for. This book has been designed to you can study on your own and is aimed at those who are currently at a band 5 to 5.5 and want to achieve a band 6 or higher. 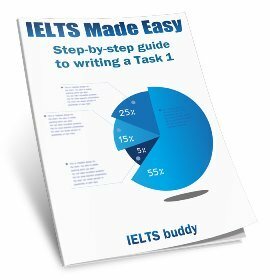 There are 12 units in this book, and each unit focuses on a specific topic area of IELTS and a specific type of IELTS reading question, such as matching, short answer etc. The units provide vocabulary practice and examination strategies and tips for the test. This book is aimed at those who currently have a low level of reading skills, around band 3-4. The book takes into account the specific language needs to learners at this low level. The book is divided into units with tips, strategies and practice for the reading question types you will come across on the exam. Common errors are highlighted and there is a full reading practice test. This book is a bit more challenging than some so it will be suitable if you are currently at a higher level and are requiring a band 7 or higher. It provides you with practice with specific skills that will be needed in the test. For example, giving you paragraphs with only the topic sentence so you can practice finding as much information as you can from the topic sentence. It is combined with writing, so there is also guidance on the grammar and process of writing essays and graphs. This book contains 10 reading tests with answer key. The tests are the same as those you will get in the test. There is a focus on improving your speed as you read which is very important if you want to be successful in the reading test. This IELTS book is based around 12 units, each with a different theme. It is designed for self-study but can also be used to supplement a course book in class. It is primarily aimed at those who are around a band 5 to 5.5 and want to get a 6 or higher. Each unit provides practice with IELTS type questions and there is a full listening practice test in the final unit. This self-study book uses a guided-learning approach. It is aimed at those who are a lower-level of ability - principally those who are around a band 3 to 4. There are 12 units and each chapter has key vocabulary and grammar for that unit. There are exam tips and common errors. The use of more accurate and less common vocabulary is more important for those who want to get a band 6.5 or higher. This book is especially for this. It can be used for self-study and focuses on vocabulary building exercises. It includes exam tips and also focuses on collocations and paraphrasing. The vocabulary is shown in genuine contexts. There is a CD included for the listening and pronounciation exercises. As with the above book, this one is University of Cambridge. This one is not for advanced so can be used for anyone doing the IELTS test. Again, the vocabulary is shown in context. There are practice exercises and also the language needed to describe data and processes. This book can be used to study on your own or to supplement classes. It contains topic specific vocabulary sections, plus sections that deal with particular areas and language for IELTS such as comparing and contrasting, phrasel verbs and presenting an argument. 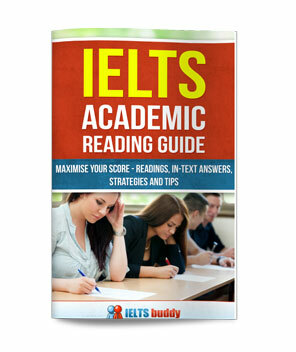 This IELTS book is more advanced and is for those who are needing a higher score to get into some of the top universities. It therefore works on getting you a band 6.5 or higher. It is built around topics and themes and includes synonyms, phrases and collocations. Important words from the Academic Word List are also covered. This book is aimed at those who are currently at a band 5 to 5.5 and want to get a band 6 or higher. There are practice exams at the end of each unit, and there are also audio CDs for listening and speaking practice. There are not many books focusing only on IELTS grammar. This student's book can be used as a self-study book as it also has the answers. So it is a good way to revise and practice key grammar points. The book specifically uses the grammar in the context of the IELTS test. It can be used for the Academic Module and General Training. It also provides listening exercises and there is a CD included. This book is aimed at those currently at a band 5 to 5.5 level. There are twenty units, each presenting key areas of grammar. There are practice exercises similar to the ones in the IELTS test. It includes exam strategies and tips to help you improve your IELTS score, and there are practice exam sections at the end of each unit. An Audio CD contains texts for Listening practice as well as model answers to show how some grammar structures are used in the IELTS Speaking test.